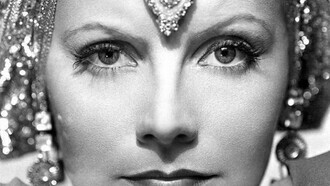 Just as the other princes of fashion that followed after his era received some influence of dressmaking from their mothers or grandparents-Hubert de Givenchy, groomed in design through his set designer great-grandfather; Pierre Balmain, raised by a drapery businessman father and fashion boutique owner mother; Gianni Versace, cradled under his dressmaker mother’s wings, and so on—so was the legendary Cristóbal Balenciaga, who was ushered to the fashion world by his seamstress mother. In the later years, this transfusion of family blood into a stream of dedicated followers will open a new window that will finally, undress the master’s ingenuity to the world. The influential figure’s unruffled silence would no longer remain clandestine. In 2011, the Cristóbal Balenciaga Museum opened in his hometown, Getaria, Spain. 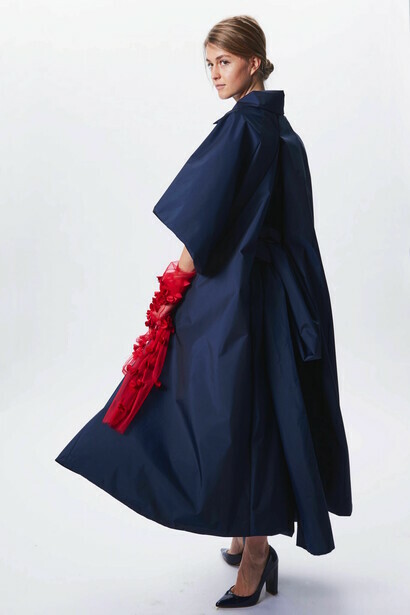 With over 1,200 pieces designed by Balenciaga, the museum honors the heritage and legacy of the giant artist, and at the same time, promotes the development of the dynamic fashion industry through numerous expositions carving the silhouette of haute couture techniques, material, and design approach for future wear. Currently, an explosive exhibition, “Transmissions-Heritage and New Creation” is running until the 2nd of September this year at the Cristóbal Balenciaga Museum in Getaria, Spain. The innovative project has successfully assembled professors and students from six prestigious international fashion design schools: Central Saint Martins (University of Arts London, London, England), The Royal Danish Academy of Fine Arts (Copenhagen, Denmark), Iceland Academy of the Arts (Reykjavik, Iceland), Shenkar College of Engineering, Design and Art (Ramat Gan, Israel), Seika Kyoto University (Kyoto, Japan) and Parsons The New School of Design (New York, USA). 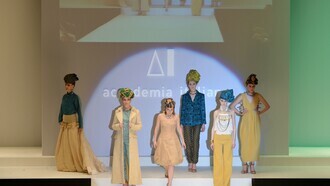 With both educational and creative missions to immerse philosophical ideas, techniques, and artistic senses surrounding the biographical context of Cristóbal Balenciaga, the program has implanted a vital seed in the minds and hands of 26 young generation design students to cultivate infinite possibilities in fashion that shape social and environmental experiences of contemporary times. The wonderful display circulates around four themes focusing on the subject, Revolution of the Silhouette: Reinterpreting Tailoring, Exploring Prints and Materials, Experimenting with Shapes, and Extreme Silhouettes. 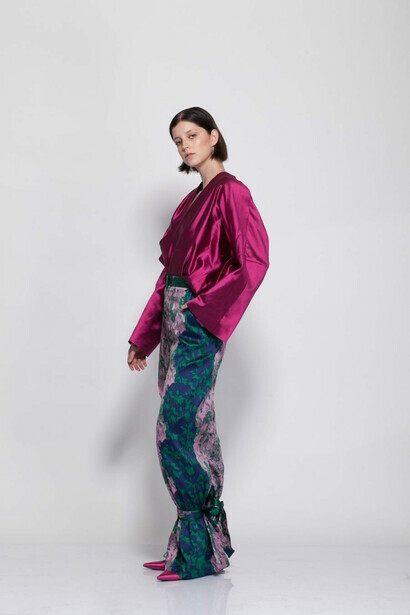 Elisa Palomino, BA Fashion Print Course Leader at Central Saint Martin, University of Arts London and Project Education Advisor for the Transmissions-Heritage and New Creations exhibition discusses her philosophies behind this exciting project. Apart from being an experienced educator with an extensive history of working across educational institutions, including international universities, museums and galleries, Elisa is also a recognized fashion designer with an impressive background in the fashion luxury brands, such as LVMH, John Galliano, Christian Dior, Roberto Cavalli, Moschino and Diane von Furstenberg. In 2010 she launched her own label showing for five consecutive seasons at New York, Milan, Rome, Madrid and London fashion weeks. How did the Transmissions project and Cristóbal Balenciaga Museum collaboration proposal come up? Elisa: Although fashion museums provide great resources for students and the public, they are often underutilized. A challenge for many museums is that only students and faculty within a specific department or local proximity have access to or knowledge of the collection. Through this international educational project that I coordinated as their education adviser, Cristóbal Balenciaga Museum opened its door to five top international fashion universities providing access to its collections globally. Central Saints Martin has been collaborating for the past four years with the Cristóbal Balenciaga Museum. 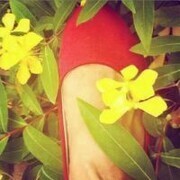 Why and how did you choose Balenciaga for this project? The museum houses one of the most relevant collection of creations by Cristóbal Balenciaga (+2000 items) at an international level owing to the number and quality of the pieces in the collection and to the timespan they cover. 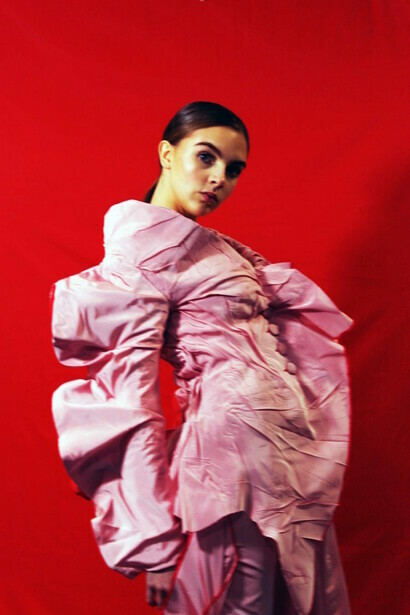 Drawing inspiration from the archives of the Cristóbal Balenciaga Museum, the students have explored Balenciaga's pioneering use of fabrics, revolutionary shapes and exquisite attention to detail. What were the criteria or requirements for the selection of the students’ designs? The exhibition displays the work of twenty-six students. Alongside their garments are their sketchbooks with research, drawings, photographs, fabric samples and toiles, providing a unique insight into each student’s creative practice and specific work methodologies from each University. The number of students from each university was selected in relationship to the student participation in the project. 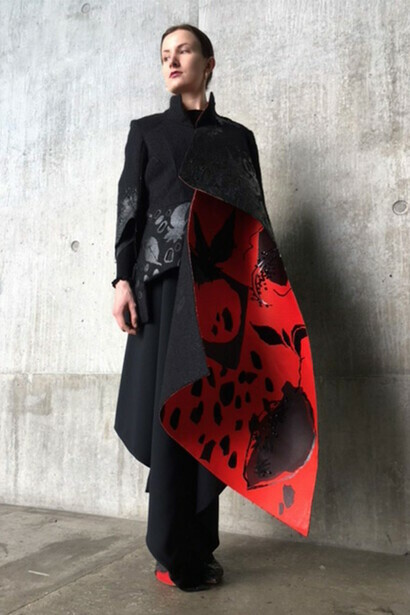 The connection of the design output to Balenciaga’s volume, shapes and legacy as well as design innovation and technical virtuosity were taken into consideration while choosing the students’ works. Does the project focus on a particular theme or style of fashion design, and what would be its relevance to contemporary fashion? 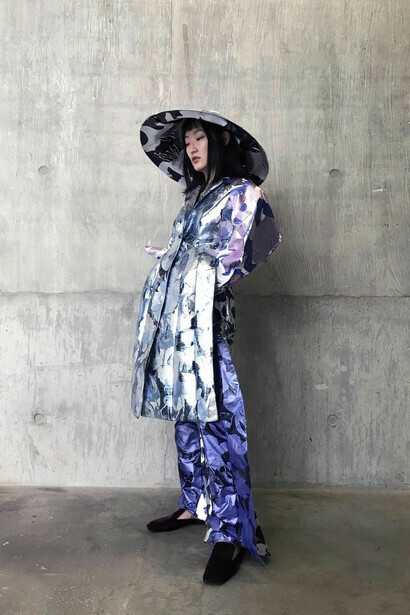 We studied Balenciaga’s revolutionary shapes and disappearing traditional crafts, encouraging students on re-introducing such techniques into their own work. Costumes and textiles are very fragile, so viewing historical Balenciaga pieces from close and inside out has been an extremely interesting experience both for students and pattern cutting tutors. Igor, the museum curator managed to develop a very intimate relationship with them. 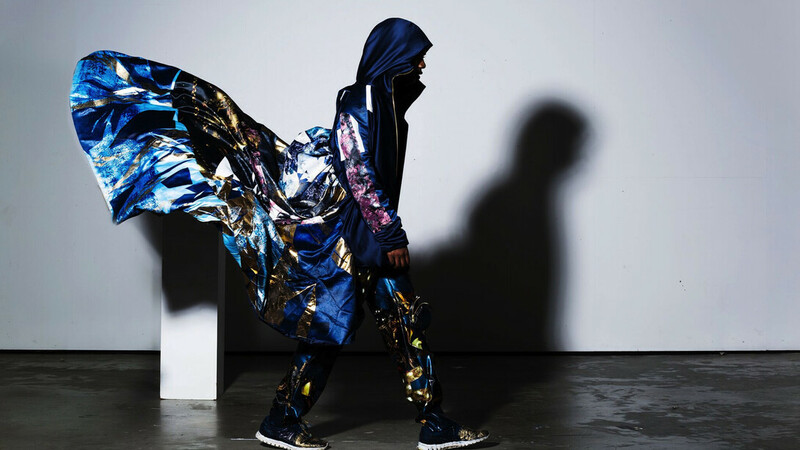 What would be the largest contribution of the Transmissions project to today’s fashion industry? This project has educated a broadest segment of the fashion university population and it has advanced the knowledge of fashion because it has made it accessible to more people. Taking students out of the classroom and into the museum archives can provide an intellectually and aesthetically engaging learning experience. This study trip has helped us to discover the creative heritage of Cristóbal Balenciaga, one of the most influential fashion designers in history through direct study of his work. Students and design and pattern cutting tutors conducted archival visits to the Balenciaga museum during 2017. This project has offered an in-depth exploration of Cristóbal Balenciaga. By visiting his hometown, we have been able to discover the lifestyle, values and culture of the area, tasting local food and wines and walking through the streets of the historic village of Getaria. Tutors and students from different universities visited the museum simultaneously and they all gathered for the exhibition’s private view. This project has proved to be a great way of networking amongst museum curators, universitiy educators and students. Just as it was then, when Balenciaga watched the careful hands of his seamstress mother, so have the young, curious students been able to use their fingers and eyes to grasp the Master’s legacy. Likewise, many world couturiers have continued to praise Balenciaga’s “almost perfect” understanding of the movements and needs of the human body, just as Hamish Bowles, Vogue's editor-at-large, has remarked, "When the wearer moved, a current of air circulated between the layers, causing the dress alternately to float and caress the body". It is perhaps, with this caress that all young apparel creators are showered with that irresistible inspiration to re-invent, re-imagine and reshape the meaning of fashion for the future in the silhouette of the Master Cristóbal Balenciaga. Ivana Bataković, profession.. top model!